Teymouri, A., Bashiri, M. (2018). An integrated model for multi-period fuel management and fire suppression preparedness planning in forests (Appreciated as the best paper of 14th International Industrial Engineering Conference). 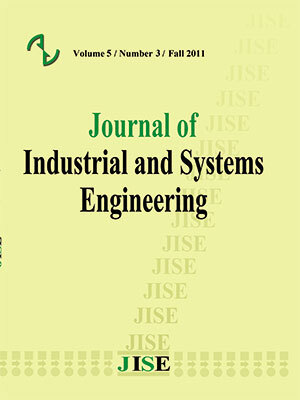 Journal of Industrial and Systems Engineering, 11(Special issue: 14th International Industrial Engineering Conference), 73-84. Ashkan Teymouri; Mahdi Bashiri. "An integrated model for multi-period fuel management and fire suppression preparedness planning in forests (Appreciated as the best paper of 14th International Industrial Engineering Conference)". Journal of Industrial and Systems Engineering, 11, Special issue: 14th International Industrial Engineering Conference, 2018, 73-84. Teymouri, A., Bashiri, M. (2018). 'An integrated model for multi-period fuel management and fire suppression preparedness planning in forests (Appreciated as the best paper of 14th International Industrial Engineering Conference)', Journal of Industrial and Systems Engineering, 11(Special issue: 14th International Industrial Engineering Conference), pp. 73-84. Teymouri, A., Bashiri, M. An integrated model for multi-period fuel management and fire suppression preparedness planning in forests (Appreciated as the best paper of 14th International Industrial Engineering Conference). Journal of Industrial and Systems Engineering, 2018; 11(Special issue: 14th International Industrial Engineering Conference): 73-84. Wildfires are of the forest-related disasters caused by inhumane factors. Spreading of these fires is due to the increase of the density of flammable plants. Two important approaches to prevent this occurrence are fuel treatment and fire suppression resources preparedness. In this paper, a mixed integer programming model is proposed based on the covering location and assignment problems which seeks fuel reduction over a multi period of time in a forest area, along with fire suppression resources preparedness and dispatch of firefighters in the last period. One of the forest areas in northern Iran was considered to fuel treatment and fire suppression resources preparedness and assuming the growth of vegetation species varies in different parts, the region is separated into distinct and discrete network points. Obtained results of the model solving show an increase in the vegetation cover volume and reduction of the risk of fire. Finney, M. A. (2001). Design of regular landscape fuel treatment patterns for modifying fire growth and behavior. Forest Science, 47(2), 219-228. Hof, J., Omi, P. N., Bevers, M., & Laven, R. D. (2000). A timing-oriented approach to spatial allocation of fire management effort. Forest Science, 46(3), 442-451. Martell, D. (2011). The development and implementation of forest and wildland fire management decision support systems: reflections on past practices and emerging needs and challenges. Mathematical and Computational Forestry & Natural-Resource Sciences (MCFNS), 3(1), 18-26. Mercer, D. E., Haight, R. G., & Prestemon, J. P. (2008). Analyzing trade-offs between fuels management, suppression, and damages from wildfire. In The economics of forest disturbances (pp. 247-272). Springer, Dordrecht. Minas, J. P., & Hearne, J. W. (2016). An optimization model for aggregation of prescribed burn units. Top, 24(1), 180-195. Minas, J., Hearne, J., & Martell, D. (2015). An integrated optimization model for fuel management and fire suppression preparedness planning. Annals of operations Research, 232(1), 201-215. Minas, J. P., Hearne, J. W., & Martell, D. L. (2014). A spatial optimisation model for multi-period landscape level fuel management to mitigate wildfire impacts. European Journal of Operational Research, 232(2), 412-422. Rachmawati, R., Ozlen, M., Reinke, K. J., & Hearne, J. W. (2015). A model for solving the prescribed burn planning problem. SpringerPlus, 4(1), 630. Reinhardt, E. D., Keane, R. E., Calkin, D. E., & Cohen, J. D. (2008). Objectives and considerations for wildland fuel treatment in forested ecosystems of the interior western United States. Forest Ecology and Management, 256(12), 1997-2006. Shahparvari, S., Chhetri, P., Abareshi, A., & Abbasi, B. (2015). Multi-objective decision analytics for short-notice bushfire evacuation: An Australian case study. Australasian Journal of Information Systems, 19. Wei, Y. (2012). Optimize landscape fuel treatment locations to create control opportunities for future fires. Canadian Journal of Forest Research, 42(6), 1002-1014.